Some might consider that Trump extols his own brilliance (one of his favorite words) ad nauseam here. His audacity is further on display in his challenge to his publisher not to excise his criticism of New Yorker editor Tina Brown for printing an unflattering profile she had assured him he'd ""love""--Brown's husband, readers will recall, is Harry Evans, head of Random House in the Newhouse conglomerate that owns Trump's publisher as well as the New Yorker. His book also becomes an occasion to get even with perceived wrongs: ""You've got to tackle and hit real hard."" Writing with CNBC correspondent Bohner, The Donald lets rip--at the press, which is rarely complimentary toward him; at women who, like Alley Cat, claim he's smitten with them; at folk who try to shake his hand (he has a thing about germs). Readers will be amused that Trump considers himself irresistible to women but doesn't seem to have factored in his wealth as an aphrodisiac. 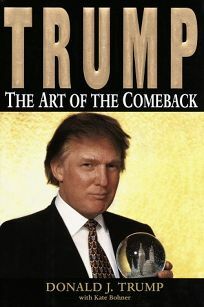 As his book's title makes clear, Trump, who had widely reported financial problems earlier in the decade, now has many real-estate projects under way, which he publicizes so extensively here that sections of his book read like a sales brochure. Photos. 250,000 first printing; author tour. (Oct.) FYI: Trump is embargoed for prepublication review.